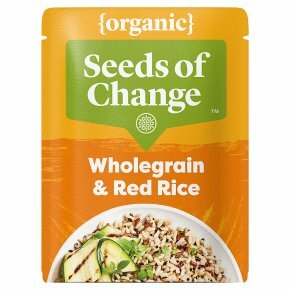 Organic gently steamed wholegrain rice, red rice, black quinoa and flaxseed. Organically grown. Serves 2. Ready in 90 seconds. No artificial colours, flavours or preservatives. Suitable for vegetarians. Give the pouch a squeeze to separate rice.Boil 30ml (about 2tbsp) water.Once boiled, add rice, cover and simmer for 3 mins.Fluff rice with a fork and you're ready to serve. Give the pouch a squeeze to separate rice.Tear open the top corner slightly.Heat at 700W for 2 minutes or at 900W for 90 seconds.Fluff rice with a fork and you're ready to serve.